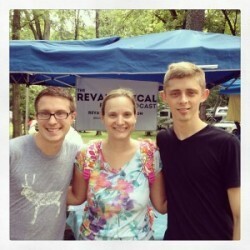 This week the Revangelical podcast has posted an interview I did at the Wild Goose Festival. Usually at the Wild Goose, I’m the one doing the interviewing, but this time the tables are turned and the questions were for me. What was a Mormon doing at the Wild Goose Festival? What overlap might there be between progressive Mormonism and progressive evangelical Protestantism? Revangelical‘s founder, Brandan Robertson, is an evangelical college student at Moody Bible Institute who has been studying Mormonism for several years — not because he’s out to persuade the world that Mormonism is a false religion, but because he sometimes wonders himself whether it might not be true.